How many cloudy years per millennia? One of the ways that the 10,000 year Clock of the Long Now will stay accurate over the millennia is with a solar synchronizer. The interesting question that comes up with doing this, is that we need to understand how long a period we might expect there to be no sun over the course of several millennia. In 1999 Long Now purchased a desert site in eastern Nevada whose upper reaches are covered in very long lived bristlecone trees. 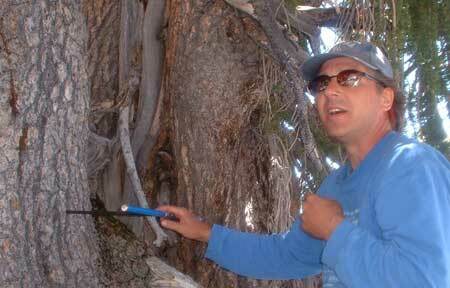 In recent years we have been working with Matthew Salzer of the University of Arizona Tree Ring Lab who has been sampling bristlecones all over the southwest in a climate research project (including the trees on our property). He has recently published those finding in an excellent paper. From this paper we have learned how many cloudy years there have been over the last 5000. Since a bristlecones growth rings are further apart in warm years of fast growth, and narrower or non existent in cold years, Salzer is able to tell us the weather over 5000 years. Below you can see a graph of just the last 1000 years of the tree you see him coring above (you might also note that the last 50 years show the most growth in the last 1000). In the notes below you can see the absent and micro rings that, (when correlated to other trees,) can tell you about how many cloudy years there have been. These in turn are aligned to historical records, where possible, of major volcanic eruptions, or meteor impacts that might have occluded or decreased sun over the whole planet for a year or more. 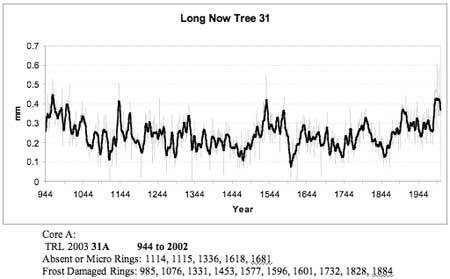 In their paper it looks as though there are over 20 separate years where there was not enough warmth or sunshine for bristlecone tree ring growth. These are the years that our Clock would have to be accurate enough on its own to make it through without a synchronization.